After our big day on Sunday, it was decided that Monday would be a do-nothing day. It was delightful. I did laundry. We were given next Sunday’s passages, and gave them a look (we’ll both be preaching on Sunday, at different services). Jared made a couple days’ worth of breakfast and lunches, and we meal-planned. We had long talks. The weather, it turns out, agreed with this inclination. We got facebook messages and phone calls from our new friends, making sure we knew it was really cold today. The high was -37 C (-35 F) with windchills down to -63 C (-81 F). Jared wrapped himself up and went on a very short walk, just to see what it was like, or maybe to prove that he wouldn’t die. Naomi and I succeeded in not stepping out the front door for even one moment. I suppose our new friends might have been worried that we’d be scared off by this extreme weather? To us, most of it is rather extreme, but we’re acquiring a new sense of relativity. Like, -37 C is “really awfully cold”, -34 C is “about as cold as one might be able to stand,” -25 C is “not so bad,” and -19 C is a downright nice day. Or something. I’m sure everyone has their own feelings about it. I can tell you that as I write this paragraph, it’s -21 C (-6 F), and we’re looking forward to a pleasant walk to the museum. I think that everywhere in the world has their own setting for “too cold.” Before we left, we were talking to some friends from the south of Canada, who were perfectly used to -20 C, but when we talked about the weather in the north of Canada, and said “oh yeah, I don’t think I could handle that.” Then yesterday, talking to a woman who is from Iqaluit, she was talking about that really cold Monday, and said “they’re used to that kind of cold west of here, but we aren’t used to it.” I guess we all just get used to the range of whatever is our home, and we all tend to dislike the very bottom of that range. And I suspect one can alter one’s range of normal. Like a rather larger version of changing the shower tap, or drinking different milk… it feels all wrong for a while, then you get used to it. All that is a very long way of saying, we did pretty much nothing on Monday. Naomi discovered the teevee. It’s not like she’s never seen one before, but she is only now interested enough to more or less pay attention to it for a whole half hour. Her first movie (if you don’t count the Lego movie which played in the background sometime over Christmas) was Herbie Goes to Monte Carlo. An extraordinarily silly slice of my childhood. Meanwhile the wind whistled and snow blew outside, and we were snug as bugs in a rug. Tuesday involved some real excitement, as we walked to the local library for story time. It was nice out that day (-19 C / -2 F), with snow. Jonas called that day “white-out conditions.” Not because it was like a blizzard, but because you only had about 1 km visibility. Mostly relevant to planes. It feels lighter than this when the sun is out, but my camera keeps registering overcast days as dark and dreary. I assure you, it felt bright and light when the above picture was taken. It’s also worth noting that the snow here in the depths of winter is not wet, sticky snow. It’s all powder. Good for sledding, bad for snowmen. Easy to plow (I imagine), and just blows away. So even though it snows fairly often, it’s not like being buried in a 4-foot Buffalo snow storm all the time. It sounds like they get more wet snow in like November and May. I did quail a little bit when I heard that things don’t really thaw until May or June. I’m digressing again. Back to the walk to the library. Jared tried to carry N to the library in the ring sling in his coat, but between her big-girl strength and her bulky, slippery snow pants, there was no way to keep her from popping her seat. Jared just had to hold her flat against him for most of the walk, while I made sure she didn’t fall out the bottom. Sigh. For about the hundredth time, I wish I had brought the Girasol. The library is that light blue building off in the distance. I swear, when we were out there it felt like a bright, pleasant morning! I even checked to make sure the camera wasn’t set to under-expose. N’s favorite part was craft time. Any occasion for playing with someone else’s crayons is a win in her book. It’s a great little library; the children’s area is extensive. We ran into the small trouble that most libraries in the US also have a lot of toys in the children’s section, so N associates the library with toys. So we’ve been having plenty of discussion of how libraries are for books. Of course, she has now contented herself that libraries are at least for crayons. The library shares a building with the larger visitor’s center, which has some cool museum-type displays about local wildlife and history. This tapestry just stopped me in my tracks. The walk back was slightly less miserable for kidlet, since some new friends offered us the use of their fancy stroller, which is in between the sizes of their two kids. They met us at story time to pass it off. It’s a Bob, tricked out with wind shield, stroller blanket, bike lock, emergency hand brake… solid equipment! N objected almost as much to having her feet trapped inside a stroller blanket as she had objected to being in the wrap. But I am confident she will get over it, since it’s darn well worth reaching the destination, and either way it’s less suffering for the adults in the equation. A closer shot of the elementary school right behind the cathedral. We headed back right before lunchtime – apparently everybody, from school kids to adults who commute on foot, goes home for lunch. Wednesday we got to visit the local hospital. It’s a very up-to-date facility, with an enormous new main wing completed less than ten years ago. People fly here from all over the region to have their babies and have any procedures that aren’t available in the small communities. They can handle a lot, it seems, though people with the most complicated cases are flown to Ottawa. The clergy at the Anglican cathedral also act as the on-call chaplains for the hospital. This includes ministering to people who are flown in from smaller communities, even when that means the nurses have to translate. We didn’t really get to visit anyone while we were there, but I wasn’t really expecting to, and it would have been difficult with a toddler in tow anyway. Jonas gave us the lay of the place, and where we and how we would find people we were coming to visit. Back home, N likes to look out the big picture window at all hours. We stand her feet on the windowsill and let her look to heart’s content. She likes to watch “people walkin'” and all variety of choochoos and trucks. We started leaving the windex on the windowsill, so after she’s done, we can still see out the window too. It’s been slower reprogramming our brains to the early dark. The sun comes up around 8:30 right now, by which point we’re still approaching functionality, so that’s no big deal. But it goes down around 3, and I am past the point of being unnerved by it, but my brain is still easily tricked by it. I keep thinking to myself, “Oh, it’s pitch dark, it’s probably dinnertime soon,” so I don’t try to do anything interesting. Meanwhile it’s not even 4, and around 5 I realize I did have enough time to do something but now I don’t, and by then I’m thoroughly bored, just because my brain has a specific idea of what “dark” means. But at this longitude, it seems like that’s more something to keep an eye on than to worry about. We’re not actually in the arctic circle, so they don’t ever get endless day or endless light here. Besides, it changes so fast. By the time we leave, there will be at least half an hour more sunlight than when we arrived. Still, vitamin D is a serious commodity around here. All that is a very long way of saying, we didn’t do that much in the afternoons on Tuesday and Wednesday. We did, however, get some visitors. We had more helpful chats with the Suffragan bishop, who lives here, and the Diocesan bishop, +David, who just happens to be in town. We have a good idea now of what the opportunities here are, what would be the best fit for us in this diocese, what we’d have to do to get here, and other practical matters. Being here when Bishop David just happens to be in town to give some training to the lay leaders, we’ve also gotten a first-hand look at what his broader vision is for the diocese, and how he’s helping these communities (the majority of which do not have full-time clergy) figure out how to do ministry. The situation is getting clearer. It’ll probably be a while before I can say much more than that on here. We’re praying for clarity, and for agreement, because no matter how you slice it, this is a big decision. For myself, I’m asking for sleep and patience. More later on Wednesday night, Thursday, and Friday’s adventures. 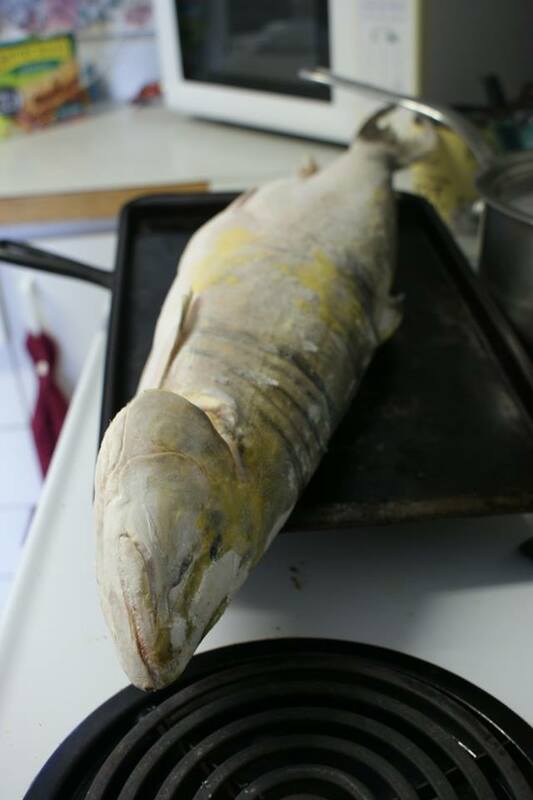 For now, I have a giant arctic char just barely thawed in my fridge that is about to become filets. Rebecca, Today it is 81 degrees F here, in the daytime, which is too darn cold! Our absolute range of temperatures is from a rare low of 77 at night in winter to 93 for a few days in the heart of summer. Most of the time it’s about 85-88, with a breeze. So your account makes me shiver. When I was in first and second grade, my mother had a rule that I had to walk the 1.7 miles to the one-room schoolhouse unless the temperature was 10 below zero, or colder. Of course I told my kids that, when they complained of the short walk in bad weather to their own schools. Imagine the eye-rolling! Anyway, it’s amazing what people (especially kids) can adapt to. I had to Google “Arctic Char”. Sounds yummy! When I was a girl, we had to take cod liver oil. My grandma was merciless about finishing every last drop on the spoon! Turns out, it’s a natural source of Vit. D. I’ll bet in your [temporary?] local community, they eat (or used to eat) the livers of the char, and other fish. Lifesaving, when the sun goes so far away. I’ve been learning about microgreens. Google for info, if you haven’t bumped into this idea already. We may grow these to supplement our diet, when we finish construction of our sailboat and restart our round-the-world voyage. If you’re wondering what you will do with your green thumb if you make this big leap, you might like to look into growing microgreens (as well as assorted sprouts).